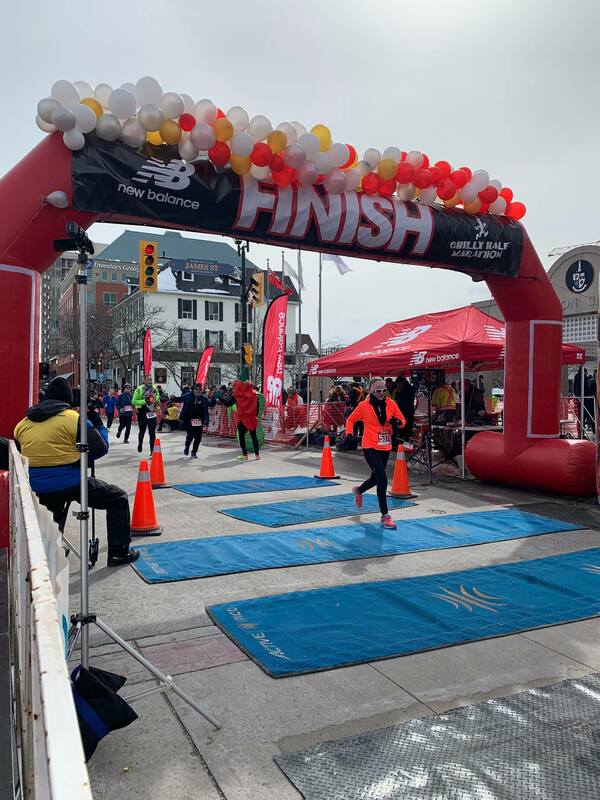 The sun was shining and the temperature was near perfect as 4,000+ runners crossed the start line of the Chilly Half Marathon & Frosty 5km on Sunday March 3, 2019, in Burlington, Ontario, including 12 Towne Fitness Runners; 6 in the Half Marathon and 6 in the Frosty 5k. The work for these races started back in November, 2018 when Towne Fitness hosted a “Running & Nutrition Workshop”. Presented by long time runner and NCCA Coach, Tim Uuksalainen and Rachel Murray RHN, our runners gained valuable information including; training and racing tips, nutrition to support training and race day tips as well as a Training Plan to guide them through to race day. Although the weather was favourable on race day it has been anything but these past months making training for our runners so much more difficult. Their hard work and perseverance paid off as all our runners represented well on Sunday with Towne Fitness runner; Susan Richardson taking second place in her age category. A tremendous accomplishment given the high level of runners present. Our first-time half marathoners; Katie Komisveric and Glenn Webber both finished ahead of their predicted times and crossed the finish line with smiling faces. Angela Gallie, a seasoned Towne Fitness runner switched up her role as a runner and ran as a pacer, running alongside Katie. Jeff Sine was also on course as a pacer. Both Patricia Hunt and Hannah Sine completed the Half Marathon with strong finishes. The Frosty 5K team consisted of; Sarah Ricci, Jillyan Quail-Davis, Jocelyn Gilbert, Amanda Arch-Webber, Tracy Smith and Andrea Davies. What a great show of sportsmanship as our Townies supported one another on course and crossed the finish line like they owned it. We would like to extend a huge “Congratulations” to our Towne Fitness Runners for not only running great races on Sunday but for following their training plans and persevering in such treacherous conditions. A definite sign of your dedication and commitment. If you are interested in running and would like to find out more about our running group, please message hannah@townefitness.ca.